The true Yorkshireman eats his apple pie with a slab of Dales cheese, usually popped under the top crust so that it melts into the hot fruit. A cheese pastry is simply a refinement of the basic principle - and very good it is, too. Make the pastry. Put the flour and cheese into a bowl. Grate in the butter and mix well with a knife (or use the processor). When the mixture resembles fine breadcrumbs, mix to a soft dough with the egg yolks and enough cold water to make a dough that holds together - about 4 tbsp. Everything must be kept as cool as possible. Work the dough lightly into a ball, cover with clingfilm and chill for at least 20 minutes - overnight would be fine. Preheat the oven to 200°C/gas 6. Roll out two-thirds of the pastry and use to line a deep pie-dish - if rectangular, about 18 x 30cm, if round, 23cm in diameter. Roll out the remaining pastry for a lid. Layer in the sliced apples, sprinkling with sugar and ground cloves, and dotting with butter as you go. 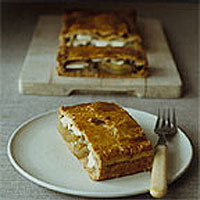 Damp the edges of the pastry, cover with the lid and seal the edges by pressing together with a fork. Make a hole in the top for the steam to escape. Decorate with pastry leaves. Beat the egg white and brush over the pastry, sprinkling with a little more sugar to give a glaze. Bake for about 45 minutes until the pastry is crisp and golden, reducing the oven temperature towards the end if the pastry is colouring too much. Serve hot with slices of cheese - slip them under the lid to melt deliciously into the apple.